I dont know how many of you spend much time watching PBS in the daytime, but with two kids I'm just about getting my fill this week. Arthur, George Shrinks, Dragontales, the list goes on and on. What ever happened to good cartoons like when we were kids? Does anybody remember The Electric Company? Yes, PBS still carries Sesame Street and Mr. Rogers, but the rest of this is mindless drivel. Does this mean I'm getting old? Maybe, but I still think our cartoons were better. 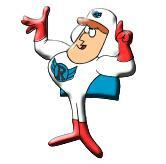 How about Roger Ramjet? Anybody remember him? Or Mighty Mouse, and Underdog? Tennessee Tuxedo? Klondike Kat? And the best of them all, Looney Tunes. Sure, you can still watch Looney Tunes if you have the Toon channel, but I think Bugs and the bunch are American icons, and we should have the Constitutional right to watch them for free. And dear Lord, please dont get me started on Saturday morning cartoons. Nothing on that doesnt have a complete line of toys for sale at Wal-Mart. Whatever happened to Captain Kangeroo and Mr. Green Jeans(although I will allow they weren't cartoons but you get the drift)? And turning Fat Albert into a movie? Please. Cant somebody please help me???????? Calm down and slowly step away from the television... I think we all need to start a letter writing campaign to get our toons back on the tube. Who's with me?? Captain Kangeroo passed away not long ago..
Not only that but whatever happened to Bugs and the gang? You can't even FIND them on TV any more!!!!! It's so sad.